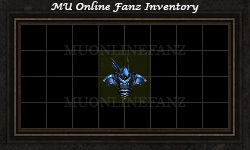 Chaos Castle Mini-game (Battle Core Server) <+> [MU Online Fanz] <+> Official 3rd-party [MU Online] Fan Site & Game Guide! 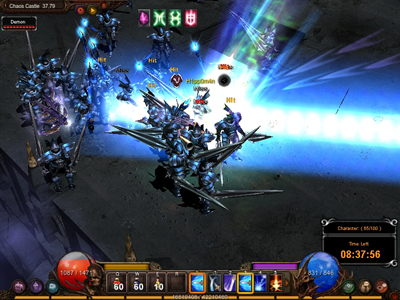 Battle Core is a unique realm where players of all realms can compete in the same minigames. In the Battle Core Server, Chaos Castle is one of the available mini-games! Chaos Castle is an arena where warriors battle to the death for prestige and prizes! The arena is not very large, and players can fall off the edge of the stage. If a player falls off the stage, the player will be disqualified. When the event starts, monster will spawn in the arena. There will be a total number of 100 enemies in the arena, including monsters and players. As enemies are killed, the Character counter UI will decrease. Parts of the floor will crumble once 50 characters are remaining. Survive the entire length of the event (last character standing). Earn the most event contribution. 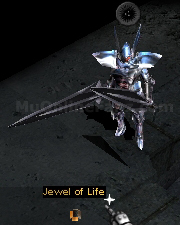 The monsters of Chaos Castle have a special skill effect, which can cause knock-back. Wearing a Ring of Fire or Pendant of Fire can decrease the chances of knock-back. If more than one player remains after the timer reaches 00:00, the winner is determined based on event contribution. Transformation Rings are not allowed. General player-to-player interface is disabled. Chat is allowed until the event begins.